IRVINE, Calif. (AP) — The Los Angeles Rams made a series of high-profile defensive acquisitions during the offseason. Defensive end Ryan Davis was not one of them. Davis signed a one-year contract two days before training camp started, an addition that could prove to be just as significant as signing defensive lineman Ndamukong Suh and trading for cornerbacks Aqib Talib and Marcus Peters. Davis’ intuition was right on, and he has found himself working extensively with the starting defense as an outside linebacker during the first three weeks of training camp. 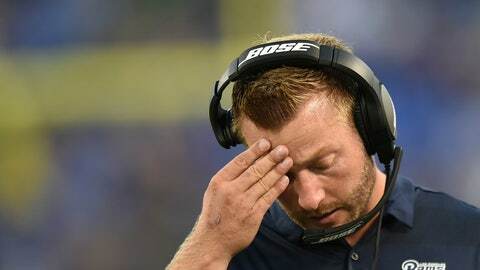 Coach Sean McVay has frequently identified Davis as one of the early standouts, though the praise apparently has not filtered down to the seven-season veteran who last played for Buffalo. The quick transition Davis has made at outside linebacker is all the more important because the Rams must replace both starters there after trading Robert Quinn to Miami in March and not re-signing free agent Connor Barwin. Quinn and Barwin combined for 13.5 sacks last season. Davis has flashed pass-rush ability with 14 career sacks, including 6 1/2 in 2014 for Jacksonville. Getting to the quarterback has always come naturally for Davis, but he is adjusting well to the coverage responsibilities of his new position. Recruited to Bethune-Cookman University as a tight end before moving to defense, Davis showed he still has soft hands during a post-practice session Saturday night catching balls from a JUGS machine. Instead, the biggest change for Davis has been rebuilding his body to handle the athletic demands of playing outside linebacker. He reported to training camp at 280 pounds, which was fine by the Rams, but it quickly became evident to Davis that he had to drop weight. Davis is still surprised by his sudden elevation to the first-unit defense, which has confirmed his belief that the Rams were the best fit. NOTES: Tight end Gerald Everett (sprained shoulder) will miss at least another week, McVay said. Everett was at practice Saturday with his left arm in a sling.